Posted Jul 27, 2018 by Eds. “Right now, in the Democratic Party, there is only one option on the table: Sanders-style socialism. That’s the main option on the table. 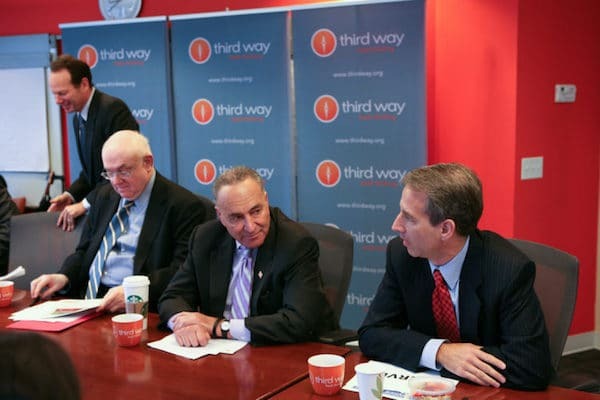 We’re doing this now because the party’s got to have a choice,” Jon Cowan, one of the presidents of Third Way, declared. It’s going to matter a hell of a lot in 2020, and so while 2020 may feel a ways off, in our mind it isn’t. And the ideas primary starts now. The only narrative that has been articulated in the Democratic Party over the past two years is the one from the left. Republicans have chosen their [path]. They’re going to run a base election, which means they have ceded the middle of the road. In my opinion, Democrats would be making a big mistake if they run a base election. We have to find common ground. “Conor Lamb won with a message that I think is a Democratic message: The tax bill was not for you. They’re trying to take your health care away,” Hoyer said. Clearly, what we found in the polls was, [voters] will listen, they’re not happy. a massive apprenticeship program to train workers, a privatized employer-funded universal pension that would supplement Social Security, and an overhaul of unemployment insurance to include skills training. Hey, why not break your back some more for America if you really want to retire?